The history of French wine and cheese is a very long one. Not only have wine and cheese been produced for centuries in France, but production of these staples is still a very common endeavor in France. Most wines and cheeses in France are specific to a certain region. This is partly because of cultural history, but also very much related to the geographical differences between different regions. For example, the grapes that are grown in the Champagne and Alsace (north and northeastern) regions of France are very different from the grapes grown in Bordeaux or Provence, which are both southern regions. In wine production, the region of origin is a very important factor. On most bottles of French wine you will see the expression vin d'AOC. AOC stands for appellation d'origine contrôlée. This stamp of approval means that there has been a surveillance process to make sure that this wine, claiming to be from Cheverny, really is produced in that region. This process not only ensures quality control, but it also protects the regional history and tradition of a wine. If a producer is growing grapes in Spain and then putting a label on the bottle that says vin de Bordeaux (Bordeaux wine), this undermines the production of genuine Bordeaux wines. While it's not necessarily that wines without this vin d'AOC stamp of approval are terrible wines, but do consider looking for this phrase when purchasing wine in France. The Institut National d'Appellations d'Origine (the National Institute for Regional Place Names) was started in 1905 in order to protect agricultural products and their history. For more than 100 years, this institute has ensured that the regional history of French wine and cheese is not taken over into a nationwide variant of brie or a general vin rouge (red wine). French cheeses come from many different regions of France, and like wine, different regions specialize in different flavors. The areas around Paris and to the northwest concentrate on the softer brie and camembert while the eastern regions produce more hard cheeses, such as emmental. Many central regions produce variants of goat cheese, whereas in other regions cow or sheep's milk is more commonly used to make cheeses.Several French cheeses include the town or region where they are produced in the name of the cheese itself. For example Brie de Meaux designates that this particular brie originates from the region of Meaux. Historically, this is important for notifying consumers of the flavor of the cheese, but these names are increasingly used as political controls on cheese production. The AOC label so common on wines is sometimes used to inform consumers purchasing cheese as well. 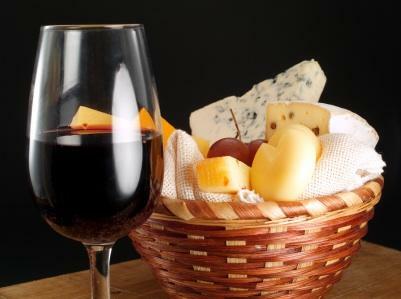 Cheese and wine are absolutely central elements of the French diet and French food. In France, traditionally people ate a warm meal in the middle of the day and then a lighter (often cold) meal in the evening. This food tradition coincides with the French philosophy of shutting everything down in the middle of the day for a well-deserved break. Children go home from school and adults go home to eat lunch together. This is gradually changing, but in general you will find this to be true when you visit France. French adults do generally drink wine in the middle of the day. Colleagues often go out for lunch together instead of going home, and a glass or two of wine is considered common practice. Wine has always been an integral part of the French dining table, perhaps as central to the French table as water is to the American table. Generally speaking, wine is not overindulged in in France; sipping wine throughout lunch or dinner is a common practice. French dining etiquette says that one should wait to have their glass refilled by someone else at the table. With cheese, it's the opposite. A platter of cheese will be passed around the table and you should take some of each cheese that you would like to eat and put it on your plate. Traditionally, the bread sits on the table instead of your plate, and you break off bite-sized pieces of bread and spread cheese from your own plate onto your bite of bread. Culturally-speaking, wine and cheese are central elements of a French meal. Fortunately, because the many variants and flavors of both wine and cheese are delicious, developing an appreciation for these important French foods takes no time at all!